Eating healthy on the go is always a challenge. 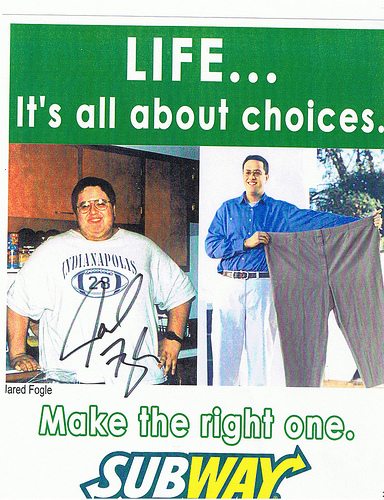 in the late 90′s early 2000s that choice seemed to be made easier with subway and Jared Fogle’s rise to stardom. The idea someone could eat out every day and lose a couple hundred pounds was amazing. the marketing engine kicked in full steam. now subway sandwiches are viewed as one of the healthiest choices you can make. Truth is it has been one of the worst. For year they used high fructose corn syrup (HFCS) in the bread and in north america azodicarbonamide. 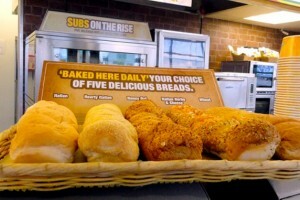 The drive for Americans to remove additives from our food has forced subway to ditch the HFCS. However until a recent article from Foodbabe brought the focus of the media to subway , they still used azodicarbonamide in the bread. What is azodicarbonamide? It is a chemical is also found in yoga mats and shoes. It is used to products to add elasticity. Even though this ingredient is considered “safe” by the FDA , It can be hazardous in large amounts, it has also been shown to cause cancer. Shortly after the media storm hit, Subway announced that they would change the bread soon.The question was how soon would that be? If you look at the pictures below they were taken at a local shop. where you can see the changing of the guard is taking place. The healthier more natural bread is now being used. Not only was the weird yoga mat material taken out but so were many other chemicals that i didn’t even know where in the bread like Sodium stearoyl lactylate. can you tell a difference? well yes you can. The bread is drier and less chewy. The taste is more like bread and less like a sweet bun. I would say I like the new bread much more. The lack of those additives makes it taste a lot like a sandwich from home and less like a subway sandwich. This by no means makes it healthy it is still an enriched carbohydrate source however when it comes to fastfood this would be better than many of your options.